A couple of days ago I saw a quote posted somewhere on Facebook that resonated with me. It was by L.R. Knost, an author known for her writing about Gentle Parenting. The quote wasn’t really about parenting though. 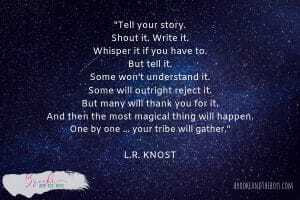 It was about telling your story. 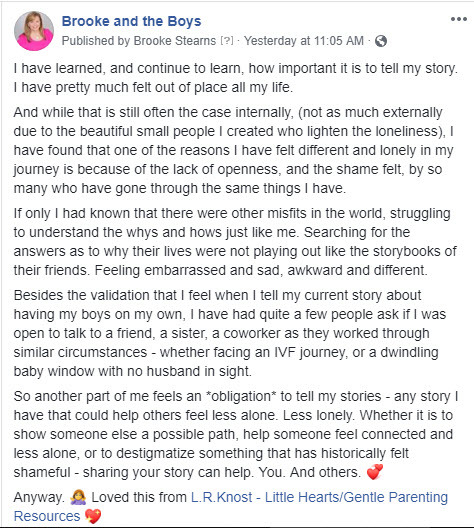 I shared the post on my Brooke and the Boys Facebook page with my own comment (below) – both of which seem to have resonated with people (with a couple of private messages as well). The older I get, the more this kind of thing resonates with me. My younger, more judgy self seems to have evolved some (thankfully) into a much less judgy self about others’ stories. While I am still passionate, obvs, and believe and feel many things very strongly, I believe I am much less judgemental than my younger, idealistic, righteous self. I am more inclined now to understand that we pretty much all do the best we can with what we have and that everyone has their own path to walk through life. 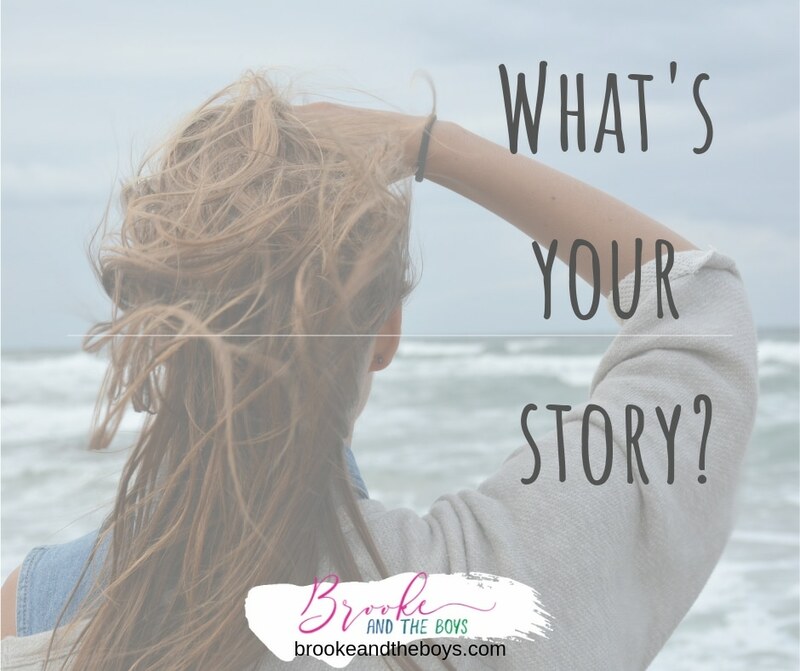 The grace and understanding I feel for others’ stories rarely extends to my own self. Why is this? Why do we do this? When I started writing THIS post, I found myself typing very similar words. 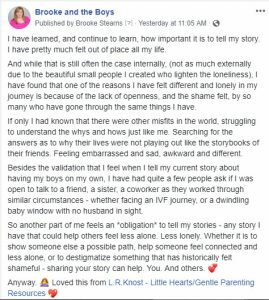 For a very long time, it has served me in some way to be BRUTAL on myself about my own stories. Perhaps it was to help me to explain the inexplicable to myself. Or perhaps it was a way to hide from parts of life that were hard and I didn’t know how to face. Maybe it was the low-level (and for a while, high-level) depression that I’ve had since fifth or sixth grade. As I have gotten older, I’m much more aware of the fact that EVERYONE has a story. Everyone has struggled, or does struggle, or will struggle, through some aspect of life that even people close to them don’t know about. And sometimes, maybe even often, it helps to let others know what’s going on in your core. And sometimes, maybe even often, it also helps other people to know they are not the only one dealing with the same thing in their core. Nobody has the same story, in the same body and mind and life, that YOU have. Nobody has the same voice as you, or the same perspective. You never know how you what you share will touch someone else, or help someone else. Life is rich and colorful and flavorful. And as Glennon Doyle says, Life is Brutiful. Day 9 of the December Self-Challenge to write a post every day this month. How am I doing on it? Eh. Started strong. Posted Day 6 at 4:00 am on technically Day 7. Wrote Day 7 – my dad came over for the night and I stayed up late talking with him and never posted it. Wrote THIS post on Day 8, but fell asleep with the small people and didn’t post it. So posting it now.